Three years ago when we launched the Transparency Report, we said we hoped it would shine some light on the scale and scope of government requests for censorship and data around the globe. Today, for the seventh time, we’re releasing new numbers showing requests from governments to remove content from our services. From July to December 2012, we received 2,285 government requests to remove 24,179 pieces of content—an increase from the 1,811 requests to remove 18,070 pieces of content that we received during the first half of 2012. As we’ve gathered and released more data over time, it’s become increasingly clear that the scope of government attempts to censor content on Google services has grown. In more places than ever, we’ve been asked by governments to remove political content that people post on our services. In this particular time period, we received court orders in several countries to remove blog posts criticizing government officials or their associates. 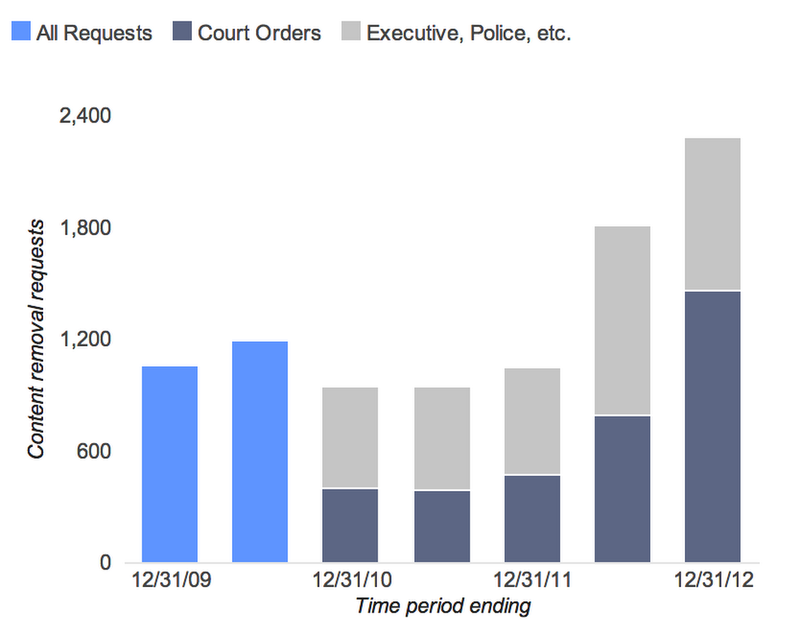 There was a sharp increase in requests from Brazil, where we received 697 requests to remove content from our platforms (of which 640 were court orders—meaning we received an average of 3.5 court orders per day during this time period), up from 191 during the first half of the year. The big reason for the spike was the municipal elections, which took place last fall. Nearly half of the total requests—316 to be exact—called for the removal of 756 pieces of content related to alleged violations of the Brazilian Electoral Code, which forbids defamation and commentary that offends candidates. We’re appealing many of these cases, on the basis that the content is protected by freedom of expression under the Brazilian Constitution. Another place where we saw an increase was from Russia, where a new law took effect last fall. In the first half of 2012, we received six requests, the most we had ever received in any given six-month period from Russia. But in the second half of the year, we received 114 requests to remove content—107 of them citing this new law. During this period, we received inquiries from 20 countries regarding YouTube videos containing clips of the movie “Innocence of Muslims.” While the videos were within our Community Guidelines, we restricted videos from view in several countries in accordance with local law after receiving formal legal complaints. We also temporarily restricted videos from view in Egypt and Libya due to the particularly difficult circumstances there. We’re now breaking down government requests about YouTube videos to clarify whether we removed videos in response to government requests for violating Community Guidelines, or whether we restricted videos from view due to local laws. You can see the details by scrolling to the bottom of each country-specific page. We’ve also refreshed the look of the Traffic section, making it easier to see where and when disruptions have occurred to Google services. You can see a map where our services are currently disrupted; you can see a map of all known disruptions since 2009; and you can more easily navigate between time periods and regions. The information we share on the Transparency Report is just a sliver of what happens on the Internet. But as we disclose more data and continue to expand it over time, we hope it helps draw attention to the laws around the world that govern the free flow of information online.